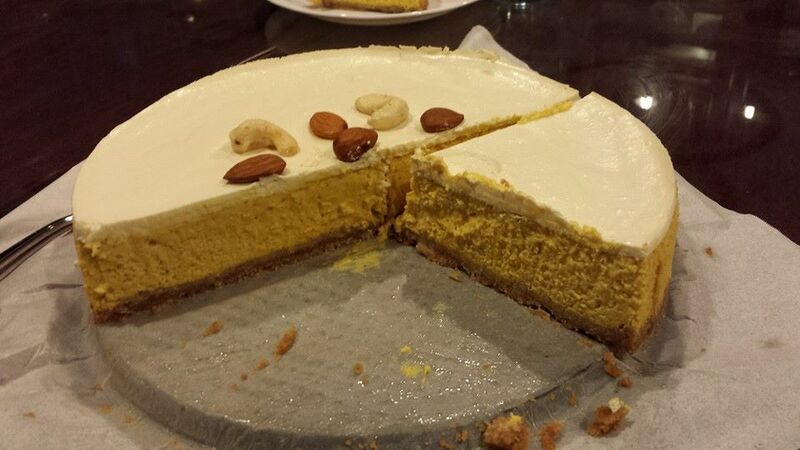 after my chocolate lava cake, tofu cheese cake, tiramisu, banoffee pie, i experimented on pumpkin cheese cake after watching the video recipe by joy of baking. the other cakes (except lava cake) were all no bake cakes, so while i could taste the cake mix & be confident of the taste, i had no idea how the experiment would turn out, whether i could get the right texture, or even if the cake could stand or collapse, and whether it would be burnt or not enough done. i made the usual biscuit base with 8 digestive biscuit (120g) crushed to sandy texture in a ziploc bag, then added 60g melted butter & pressed the “wet sand’ mixture in a 8” (20cm) spring-form cake tin line with parchment paper. then placed it in the fridge. i dice cut & steamed 300g fresh pumpkin till soft. i added 250g cream cheese & 4 tbsp flat brown sugar, 1.5 tsp cinnamon, 1/4 tsp salt, 1/4 tsp ground ginger & whisked. then i added the softened pumpkin, and then 1 egg at a time, & whisked. i used a hand whisk at medium speed & managed to get a slight rough texture for the mix. i whisked 250g sour cream & added 1 tsp brown sugar for the cream topping. i emptied the cake mixture into the cake tin & baked in 180degC preheated oven for 30mins until cake is firm (when a toothpick inserted came out cleanly) while centre just a little jiggly. left it to cool. added the whipped sour cream & baked for a further 10mins. let it cool & then placed in the fridge overnight. 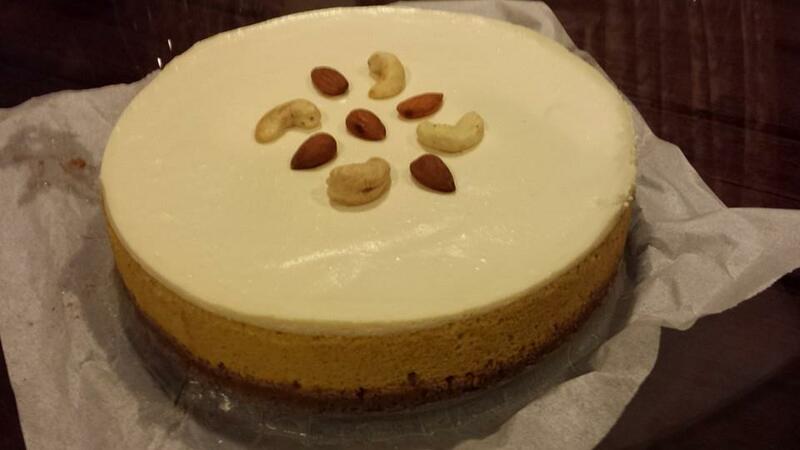 i put some roasted nuts (did not have walnut so used cashew & almonds instead). did not look that nice. biscuit base – make the usual biscuit base with 8 digestive biscuit (120g) crushed to sandy texture in a ziploc bag, then add 60g melted butter & pressed the “wet sand’ mixture in a 8” (20cm) spring-form cake tin lined with parchment paper. then place it in the fridge. dice cut & steam 300g fresh pumpkin till soft. add 250g cream cheese & 4 tbsp flat brown sugar, 1.5 tsp cinnamon, 1/4 tsp salt, 1/4 tsp ground ginger & whisked. then add the softened pumpkin, and then 1 egg at a time, & whisk. i use a hand whisk at medium speed to get a slight rough texture for the mix. then whisk 250g sour cream & add 1 tsp brown sugar for the cream topping. bake the cake – pour the cake mixture into the cake tin & baked in 180degC preheated oven for 30mins until cake is firm (when a toothpick inserted comes out cleanly) while centre just a little jiggly. leave to cool. add the whipped sour cream & bake for a further 10mins. let it cool & then place in the fridge overnight. 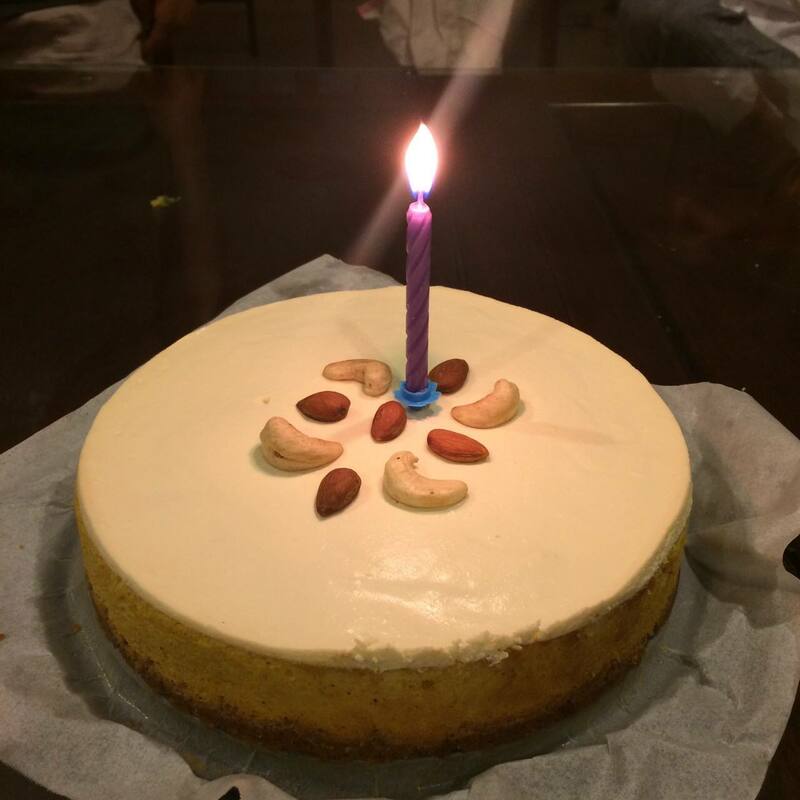 put some roasted walnut nuts on top to decorate the cake. This entry was posted in Buon Appetito! 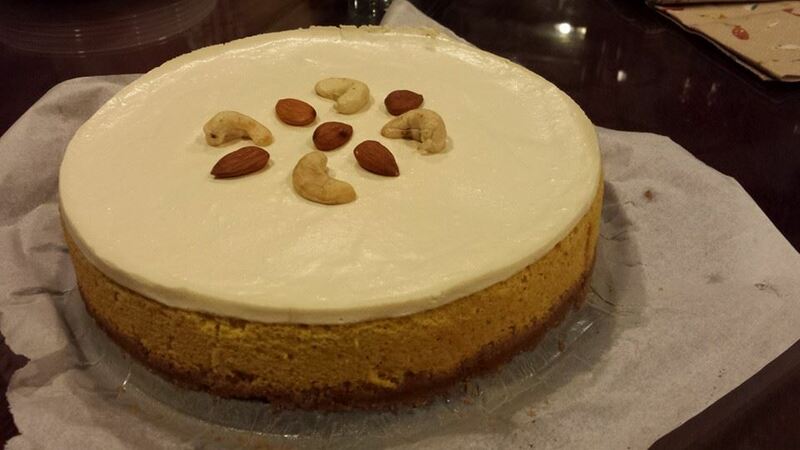 and tagged banoffee, lava cake, pumpkin cheese cake, tiramisu, tofu cheese cake. Bookmark the permalink.